Donna Lauritsen, 79, of Webster City, died Wednesday, November 1, 2017 at Van Diest Medical Center. Funeral services will be held Monday, November 6, 2017 at 11:00 a.m. at Trinity Lutheran Church in Webster City with Reverend Mike Kroona officiating. Visitation will be held one hour prior to the service at the church on Monday. Burial will be at Arlington Heights Cemetery in Audubon. Donna Rae Carrick, daughter of Ray and Dorothy Warren Carrick, was born December 7, 1937 in Bayard. She graduated from Scranton Community Schools in 1956 and attended the American Institute of Business. She worked at Hawkeye Insurance Company. Donna married Dale H. Lauritsen on May 24, 1958 at St. John’s Lutheran Church in Des Moines. They celebrated fifty nine plus years together. Their journey took them to Council Bluffs, Garner, Webster City, Shenandoah, Harlan and back to Webster City. 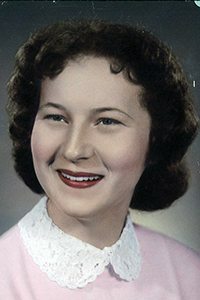 Donna is survived by her husband, Dale of Webster City; children, Terrance (Kaye) Lauritsen of Phoenix, AZ, Gary (Angela) Lauritsen of Smithton, IL and Dana Lauritsen of Webster City; four grandchildren; brother, Darwin (Peggy) Carrick of Council Bluffs; sisters-in-law, Dorothy Carrick of Greenfield, Elaine Lauritsen of Audubon and Norma Pennal of Petersburg, WV; brother-in-law, Virgil Lauritsen of Sac City; many nieces and nephews. In addition to her parents, she was preceded in death by her brother, Donald Carrick and sister, Darlene Miller. Donna was a member of Trinity Lutheran Church, the Church Circle and the Women’s Club. She was very active in all the communities in which they lived, participating in church, school, Jaycees, county blood chairman and helping elderly neighbors.